Today's card wasn't made for any challenge, it's actually a "just because I liked it" card. Seems like I don't do too many of those lately! I recently discovered a stamp company called Power Poppy. 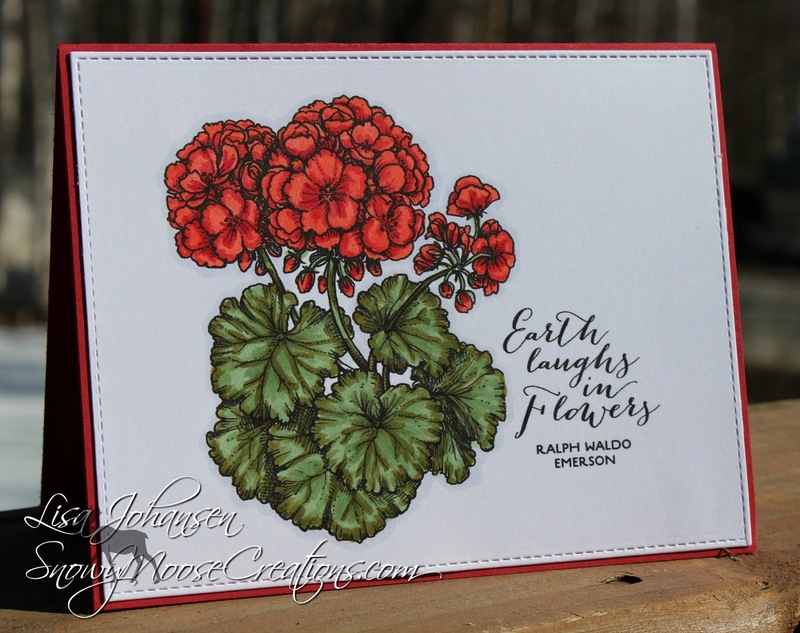 They offer clear stamps as well as digital images and she creates the most stunning flower designs. The images are so stunning and realistic, I just love them. Gardening keep me busy during our short Alaska summers and I just love watching flowers flourish in our 20+ hours of daylight. Geraniums are one of my favorite flowers and so when I saw this digital stamp I had to have it. Bright red geraniums are usually what I always buy, I love how they stand out. I didn't go super bright red with my coloring on this image but I really like how it turned out! I wanted the image to be the star of this card so kept everything very clean and simple.